Shakesville: Great Job on Halloween, Everyone! Great Job on Halloween, Everyone! One million trick-or-treaters all at once! For 11 years, we lived in a house on a fairly busy street, so we rarely got trick-or-treaters. Now that we live in a neighborhood, we get a lot more visitors on Halloween, which we love. 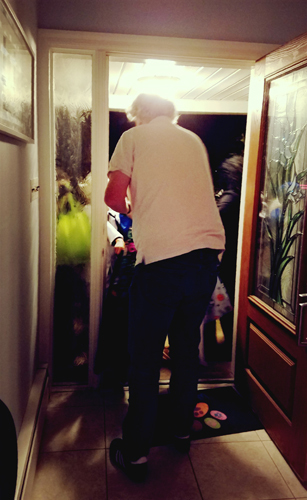 Iain handing out candy last night was basically the cutest thing ever. He kept complimenting the kids on their costumes in the greatest way. "What do we have here? Some astronaut business?! Great job! And what's this — a scary witch?! Great job! Excellent work on your outfits, everyone!" He was also handing each of them whole handfuls of candy. They were pretty excited to arrive at our house! And no wonder, because Iain does Halloween right: Tons of candy and a major self-esteem boost for every kid who comes to our door.